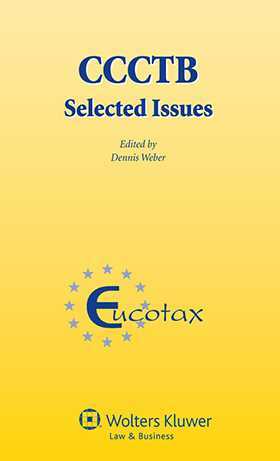 The discussion raises numerous issues likely to lead to future amendments, and for this reason, along with its practical value in developing an understanding of the proposed system’s specif ic effects, the book will be welcomed by tax consultants and lawyers worldwide, corporate tax advisers, European tax authorities and tax researchers and academics. Chapter 1 Consolidation in the CCCTB Proposal 1 Thies Sanders. Chapter 2 Relevant Aspects When Entering the System/CCCTB Group Paul H.M. Simonis. Chapter 3 Business Reorganisations within the Group Bertil Wiman . Chapter 4 Leaving a Group Jan van de Streek. Chapter 5 CCCTB: General Principles and Characteristics Ronald Russo . Chapter 6 Depreciation Rules under the Proposed CCCTB Directive 79 Hein Vermeulen . Chapter 7 Is the CCCTB Proposal in line with the Principle of Subsidiarity? : Negative Opinions Submitted by National Parliaments in the ‘Yellow Card Procedure’ Rita Szudoczky. Chapter 8 The One-Stop-Shop Approach: A Discussion of the Administrative and Procedural Aspects of the CCCTB Draft Directive J.A.R. van Eijsden. Chapter 9 Appeals Daniel Gutmann. Chapter 10 The Common Consolidated Corporate Tax Base and the Future of Taxation Theo Keijzer. Chapter 11Withholding Taxes and Relief for Double Taxation Matthijs Vogel. Chapter 12 Common Consolidated Corporate Tax Base: The Sharing Mechanism, Some General Considerations Antonio Russo. Chapter 13 Tax Planning under the CCCTB’s Formulary Apportionment Provisions: The Good, the Bad and the Ugly Walter Hellerstein. Chapter 14 CCCTB and Formulary Apportionment: The European Commission Finds the Right Formula Joann Martens Weiner. Chapter 15 The CCCTB GAAR: A Toothless Tiger or Russian Roulette? Peter Harris. Chapter 16 CFC Rule Mario Tenore. Chapter 17 CCCTB: Selected Issues – A Summary Mark van Graafeiland & Imme Kam.